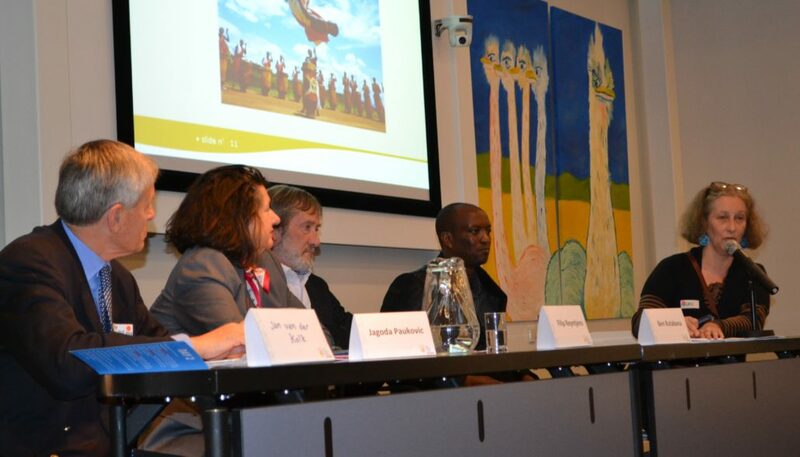 On the 5th and the 6th of November the diaspora conference on the great lake region in Africa took place at the Institute of Social Studies in The Hague. During two days, around seventy participants listened to speakers, joined plenary debates and discussed in working groups. During the first day focused on the subject of root causes. Jagoda Paukovic, an independent consultant on peacebuilding and gender, explained some of the most common definitions that are used within the academic world on what constitutes ‘conflict’. She compared those definitions by her own experiences working in many different contexts of conflict: form Myanmar to Haiti, Georgia and Congo. The second Speaker was Ben Rutabana who spoke about his own experiences and about his vision on the current situation. In a touching manner Ben explained that, as a child in Rwanda, he often had to hide in the bush with his family from people who wanted to kill them. As a Tutsi he has experienced a lot of discrimination, exclusion and finally genocide. His mother was one of the victims. In the meantime Ben had picked up arms and joined the ranks of the Rwandan Patriotic Front (RPF). After the victory by the RPF Ben was at first relieved because he thought that finally everything was changing for the better. But he soon discovered that the new regime had its own dark sides, and was ruling the country not for the people but just for themselves. Immediately after the war he quit the army and continued his fight for freedom of Rwanda by making music. Because of his clear and honest songs that were often critical of the Kagame regime, he was put in prison for six months and being severely tortured. Since 2004 Ben lives in exile. He doesn’t believe that the problem of Rwanda has to be sought in ethnicity, but rather in bad governance. The final speaker of day one was Filip Reyntjens, professor of political science at the University of Antwerp. In half an hour he clarified some of the extreme complexities of changing alliances and agitations between not only the Great Lake countries, but also, Angola, Tanzania and Sudan over the past 30 years. Also he shows the profitability of war for many actors involved, because of the looting of mineral resources involved in many of these wars. In the following working sessions the participants came up with many factors, actors and consequences of the war in Rwanda, Uganda, Burundi and DR Congo. Speakers Stéphanie Mbanzendore, Joost Puijenbroek, Dirk-Jan Koch and Jagoda Paukovic (chair). The second day of the conference focused on opportunities of peace. The main question was how the diaspora can play a positive role towards sustainable peace. Speaker Dirk-Jan Koch of The Netherlands Ministry of Foreign Affairs explained the efforts that are being done internationally to make sure that mineral resources of Congo do not contribute to war. Studies by Belgian research institute IPIS show that artisanal gold mining appears to be most connected to armed groups. According to Koch, each stakeholder of the ‘value chain’ form resource to end product has a responsibility to make sure that they only use materials that are ‘clean’. Therefore an elaborate system of inspections, and quality labels is being developed at a global level. Joost van Puijenbroek of Dutch peace organisation Pax talked about the local context of the Ituri region in Eastern Congo and explains the different aspects of a conflict that can continue a long time after an armed conflict has ended. He explains the different stages at which civil society organizations can intervene. Stéphanie Mbanzendore, founder of Burundian Women for Peace and Development (BWPD) explains how she as member of the diaspora, tries to stimulate the peace process in Burundi. Also she expresses her worries about the current situation. She ends her speech by saying: Peace is very expensive, but war is even more expensive, so we should choose the first. The final workshops were about the role of diaspora in finding peaceful solutions for the great lake region. Also attention was paid to the obstacles that often prevent diaspora from contributing positively. One of the main obstacles were found in the fact that the diaspora were so divided. There is a great lack of trust. As soon as this lack of trust may be overcome, the diaspora can play a powerful role in disseminating useful and true information, doing advocacy at government level and empowering civil society in their countries of origin. As one of the reporters from the working sessions said: something has already happened these two days, there were people in our group who admitted that they didn’t trust other participants of the conference but now they did. The conference was concluded by the plan to organize this conference annually the coming years. In the meantime a diverse and inclusive working group of diaspora members will be established in order to develop some of the proposed diaspora-initiatives.